1) In a saucepan, add the milk and 4 tablespoons butter. Let it cook over medium-high heat until the mixture is even and consistent. 2) Stir the flour into the milk. Keep stirring over medium-low heat until it forms a dough. 3) Add the dough to a cutting board. Knead the dough well. Set it aside. 4) Melt the rest of the butter in a saucepan. Add the onion and let it cook over medium-high heat until well browned. 5) Reduce the heat to medium-low, pour in the milk, and turn it to medium heat. Stir in the parsley and salt and pepper to taste. 6) Add the cornstarch to the saucepan and simmer over medium-low heat, stirring constantly until it thickens. 7) Stir in the chopped shrimp, heat through for 1 minute, and remove from heat. Set it aside to cool. 8) Sprinkle some flour over a cutting board. Take the dough and roll it out on the board and roll it thinly. Use a knife to cut them into the desired shapes. 9) Add 1 teaspoon of the shrimp filling into the middle of the shapes. Fold the dough over to form a half circle, pressing the edges together. Repeat until all the filling is used. 10) Dip the croquettes in the beaten egg, then into the bread crumbs. Set aside. 11) Add 2 inches of vegetable oil to a large frying pan. Place it on high heat. 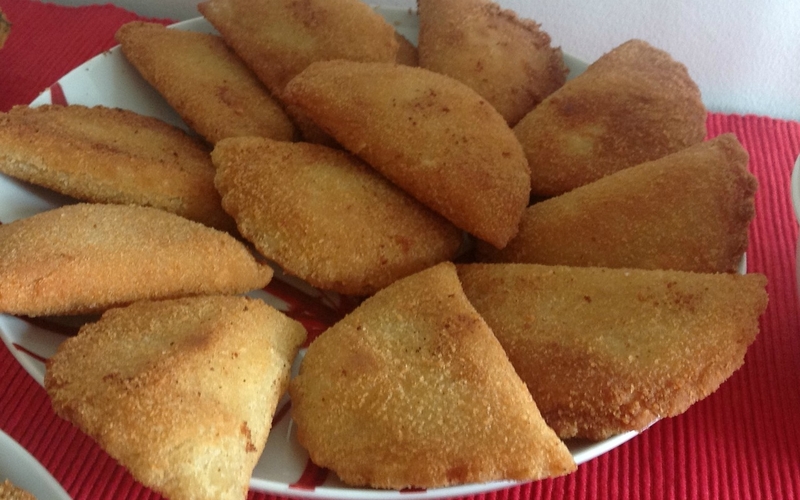 12) Fry the rissóis, one at a time, until golden brown. 13) Once they are done add them to a platter with paper towels to dry. 14) Serve them while hot with lemon quarters for extra flavor. These are authentic and outstanding! This is the 2nd year I’m making them. I also add finely chopped celery when cooking the onion. Delicious! Thank you for posting!